I received an email which included the September, 2012 online issue of the Indiana Genealogist. That issue included an article by David C Bailey Sr. regarding Indiana GAR members in California. My Great Grandfather, William Bowden LYONS, joined the 59th Infantry Regiment, but I cannot seem to find any records of his belonging to the GAR. A family story says that he was on horseback in the 1890 National Encampment in St. Louis (he had moved from Indiana to Missouri in the early 1880's.) When he died in 1899, a contingent of GAR members accompanied his casket to the train for the trip home for burial. Can anyone help me locate his Camp? My wife's great grandfather, Ludwig Louis SCHMIESING was married to a Wilhelmin Caroline WEGEHOFT in 1875 and we believe in Indiana. Their first child, my wife's grandfather, Frederick SCHMIESING was born in Indiana in 1877. They later moved to Cincinnati where they ran a dairy. In 1892 Caroline died and is buried in the Vine Street Hill Cemetery in Cincinnati. In about 1893 Louis remarried to Louisa BALLMAN in Covington, Kentucky and by 1897 the family moved to Minnesota. We have not been able to find anything on the first wife, Caroline, other than where she is buried, and there seem to be any mention of her by the family. We can not find anything out about her but believe they lived in Ripley County or another County close to Cincinnati. We have visited her grave site in Cincinnati. Thank you for help that you can give. I am researching the family of Samuel C. WEAVER b. Abt 1831 in Ohio. He married Margaret LONG, also from Ohio, abt 1865. They migrated from Ohio to Indiana (Aurburn area) about the time they were married. Lived in DeKalb County (Census info) thru abt 1900. Looking for death record and burial location. Children of this marriage included Elmer Leon WEAVER (1864-1944) and others. Many thanks for any assistance you can provide. Looking for information on the WORYK family. IIKo WORYK immigratd to West Newton, PA in 1906. I have no idea what happened to him after that. His son Dmitro WORYK was married to Stella (KAT) WORYK in Indianapolis in 1914. After I don't find them anywhere, would appreciate any help you can give. John and his family owned land near Crown Point at the time of the 1870 census. He was apparently working outside home at a sawmill in Illinois in 1872 at the time of his death. His wife ANNA (nee) MARKUS then quickly remarried and the family relocated to Iowa. US Census 1870 page 321, Center Township, Lake County, residence 258, entries 19-26. John may have been brought home for burial, we have no information on the city he died in. . Looking for information on Jonas TOTTEN, and his family. I know he was born abt 1810 in Crawford County, IN, parents unknown, and died in Camp Cottrell, TN. Jonas married on 3 of Sept 1829 to Sybil (or Siffell) ADAMS, she was born in Rutland Worcester Mass on 21 Sept 1819. My family is looking for my great grandpa, William Riley SULLIVAN. Family lore (and his death certificate) say he was born in Indiana sometime between 1840 and 1845. Family lore says he was married previously in Indiana but his first wife (name unknown) died in a tragic accident. He migrated to Missouri. Died in Polk County Missouri early 1930's. Was married to Eliza Lane in Missouri. Again, family lore and his death certificate say his father's name was "Robert" but his mother's name is "unknown." Any help would be gratefully received. The Indiana Genealogical Society has added the December 2012 issue of Indiana Genealogist, the quarterly publication for our members, to the Members Only area. IGS members can login to the IGS Records section to download their copy. As in every issue, there are also brief items from every region of the state. The issue is available for download in its regular size, as well as in a compressed version which downloads faster on slower Internet connections. The Southern Indiana Genealogical Society will meet on Thursday, January 3, 2013 at 7 pm in the Strassweg Auditorium of the New Albany-Floyd County Public Library (180 W. Spring St., New Albany Indiana). SIGS members Angelia Barger and Donna Foster will discuss the Find A Grave website and how to search it, as well as submit information on graves. The meeting is open to the public - for more information about the society, please visit http://www.rootsweb.ancestry.com/~insigs/index.html. Are you interested in self-publishing your family genealogy or memoir? Join Marlene Polster at the Porter County Public Library in Valparaiso on Saturday, January 19, 2013 at 1 pm. She is the Lake County Genealogist, the President of the Northwest Indiana Genealogical Society, and on the staff of the Porter County Public Library's Genealogy Department. Her presentation will discuss how to layout your book, what type of bindings you can use, and where to send it for printing and binding. The presentation is free - to register, please call (219) 462-0534, ext. 5. The Indiana Historical Society in Indianapolis, in partnership with Newspaper Archive, has added free access to digitized Indiana newspapers for visitors to the Eugene and Marilyn Glick Indiana History Center (located at 450 W. Ohio St. in downtown Indianapolis). For 25 years, the Indiana Historical Society (IHS) supported the Indiana Newspaper Project, which gathered historic newspapers from around the state to be microfilmed by IHS’s Preservation Imaging staff. In 2011, IHS entered into an agreement with Newspaper Archive to digitize 5,625 reels of microfilm, which represents more than 2.5 million newspaper page images dated 1924 or earlier. Now visitors to IHS's William Henry Smith Memorial Library can search or browse these Indiana newspapers for free through a site that is co-hosted and supported by Newspaper Archive. Access to these Indiana newspapers, as well as newspapers from all 50 states and several other countries, is also available via subscription at www.NewspaperArchive.com. Family Tree Magazine has named the Indiana State Digital Archives as one of its Top 75 State Websites of 2012. Along with the Indiana State Library's Genealogy Collection, they were the only 2 honorees from Indiana. Members, friends, and guests will share favorite genealogy finds at the Tuesday, January 8, 2013 meeting of the LaPorte County Genealogical Society. The show and tell will begin at 7 pm - bring anything from a question to a quilt! Weather permitting, the society meets at the Swanson Center for Older Adults, 910 State Street, LaPorte, Indiana on the second Tuesday of each month at 7 pm. The public is welcome. Joel M. MORGAN was born about 1847 in Dubois County, Indiana to parents William D. MORGAN (b. 1824) and Margaret T. ROBERTSON (b. 1822). Joel was one of 6 children born to this couple including: John W.; Joel M.; Maria A.; Enoch H.; Asa F. B.; and Charles Anthony MORGAN, all born between 1845 and 1861. Mary C. SECRIST or SECREST was born abut 1844 to parents Henry SECRIST (b. 1815) and Delana STROTHER (b. 1815). The family was from Harrison County, Indiana. The couple had 5 children including: Peter W.; Mary C.; John H.; Margaret A.; and George F. SECRIST, all born between 1832 and 1850. Joel and Mary (SECRIST) MORGAN had a daughter, Maggie M. MORGAN born 1868. Joel MORGAN died 2 December 1934 in New Albany, Floyd County, Indiana. His wife Mary C. (SECRIST) MORGAN died 5 April 1955 in New Albany and both are buried in the New Albany National Cemetery. Do you have an e-reader or other device for reading electronic books? Have you tried using it in your genealogical pursuits? The Genealogy Center of the Allen County Public Library in Fort Wayne will hold a WinterTech class on this topic on Wednesday, January 9, 2013 at 2:30 pm in the library's Meeting Room A. This free one-hour class will provide a brief introduction to using your device in your family history studies and how to locate ebooks online. To register for this free program, please e-mail Genealogy@ACPL.Info or call (260) 421-1225. For more information, see the WinterTech brochure - http://www.genealogycenter.org/Events/SingleEvent/12-09-25/e-readers_family_history.aspx. 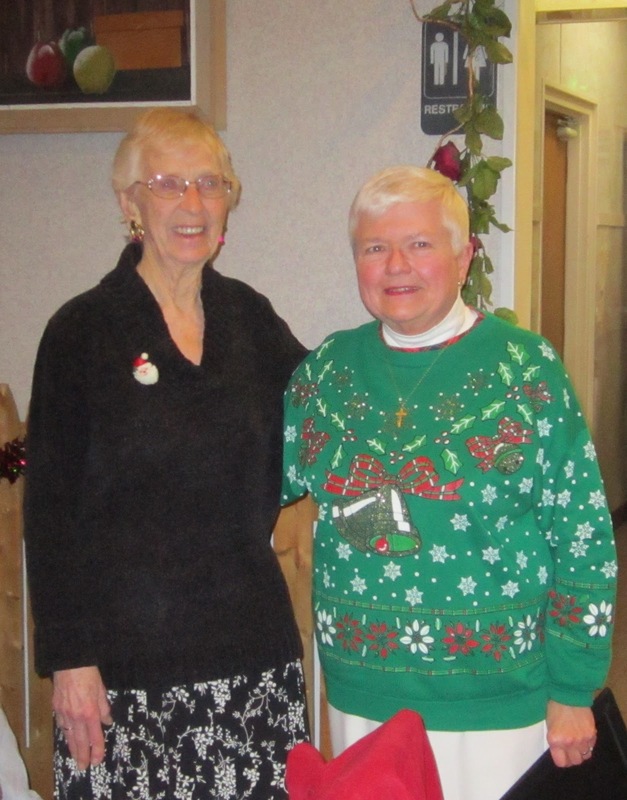 At the LaPorte County Genealogical Society's annual dinner meeting on December 11, Patricia Harris was named the society's Genealogist of the Year. Harris is one of two still-active charter members of the society, a past president and current board member, a volunteer at Michigan City Public Library, an authority on Catholic records and Polish research, and the author of a number of historical and genealogical publications including Camp Anderson 1863-1864: Michigan City's Civil War Camp. The award was presented by Fern Eddy Schultz (photo: Fern Eddy Schultz, left; Patricia Harris, right) following a convivial dinner at the Western Inn. Besides Schultz, the awards committee includes Dorothy Palmer and chairman Gloria Arndt. Weather permitting, the genealogy society meets at the Swanson Center for Older Adults, 910 State Street, La Porte, on the second Tuesday of each month at 7 pm. The public is welcome at all meetings. Membership dues are $10 individual, $12 family. The January 8, 2013 meeting will be a sharing time with members and guests bringing in favorite artifacts, stories, or research wins to tell about. 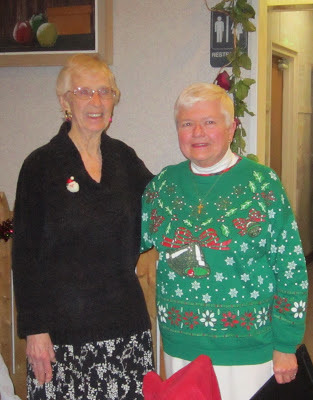 Judith Myers Ahrens has published a book about the Salamonia Christian Church in Jay County and its members. Salamonia Christian Church, 1842-1999 is a 3-volume set (softbound) totalling 662 pages. The author has researched three generations of the genealogy of nearly everyone on the church's membership roll. Many obituaries and Find A Grave memorials are included in the book. There is a section, "Milestones of the Salamonia Christian Church," which details the most important events in the life of the church, from its beginning in a log cabin to the closing of the church in 1999. Transcriptions of all of the church's board meetings are included, along with lists of the pastors and officers of the church. Indices to the major portions of the book aid in navigation. The cost of the 3-volume set is $50 plus $5 shipping. For more information, please contact the author at salamoniacc@gmail.com or the Jay County Historical Society in Portland, Indiana. The Hamilton East Public Library in Noblesville will hold a beginning genealogy class on Saturday, January 12, 2013 from 9:30 am to 12:30 pm in the library's genealogy classroom. If you are just getting started in genealogy, or are returning to genealogy after a long break, this class is for you - you'll learn about research methods and find out what's new in the world of genealogy resources. The class is free but registration is required - to register, visit the events calendar of the library's website, or call (317) 776-6939. The Indiana Genealogical Society now has 933 databases in the Members Only area. Each of Indiana's 92 counties has at least 3 databases. The Indiana Genealogical Society now has 932 databases in the Members Only area. Each of Indiana's 92 counties has at least 3 databases. The Indiana Genealogical Society now has 930 databases in the Members Only area. Each of Indiana's 92 counties has at least 3 databases. The Indiana Genealogical Society now has 929 databases in the Members Only area. Each of Indiana's 92 counties has at least 3 databases. The Hamilton East Public Library in Noblesville will hold a genealogy roundtable on Tuesday, January 8, 2013 at 2:15 pm in the library's genealogy classroom. Come share your progress in meeting your 2012 genealogy goals and what goals you have for 2013. The roundtable is free and open to the public - no registration is necessary. NOTE: Indiana Central College later became the University of Indianapolis. The Indiana Genealogical Society now has 928 databases in the Members Only area. Each of Indiana's 92 counties has at least 3 databases. The Indiana Genealogical Society now has 926 databases in the Members Only area. Each of Indiana's 92 counties has at least 3 databases. NOTE: This database was compiled from data in the 1840 census. The Indiana Genealogical Society now has 925 databases in the Members Only area. Each of Indiana's 92 counties has at least 3 databases. These 3 databases are free to the public - no membership is needed in order to view them. The Indiana Genealogical Society now has 924 databases in the Members Only area. Each of Indiana's 92 counties has at least 3 databases. The Indiana Genealogical Society has added the December 2012 issue of IGS Newsletter, the society's bi-monthly newsletter for IGS members, to the Members Only area. IGS members can login to the IGS Records section to download their copy. In this issue, President Michael Maben reviews all the good genealogy news of 2012, and we look forward to some of the big genealogy events in 2013. We also have news items from all over the state.